Today we reported on 3D renders of Huawei's upcoming foldable phone, which is set to go head to head with the Samsung Galaxy X. We know the phone is coming, because the Chinese manufacturer confirmed that it was working on a folding phone – a 5G enabled folding phone, no less – last October. To us, that V-shaped image is pretty clearly a folding phone, with the screen on the outside, as shown by the blue and red glow emanating from the screen. That's a different approach to the one taken by Samsung with its folding Galaxy X, where the screen is on the inside, like the pages of a book, and it matches with the renders of the Huawei phone we posted earlier. 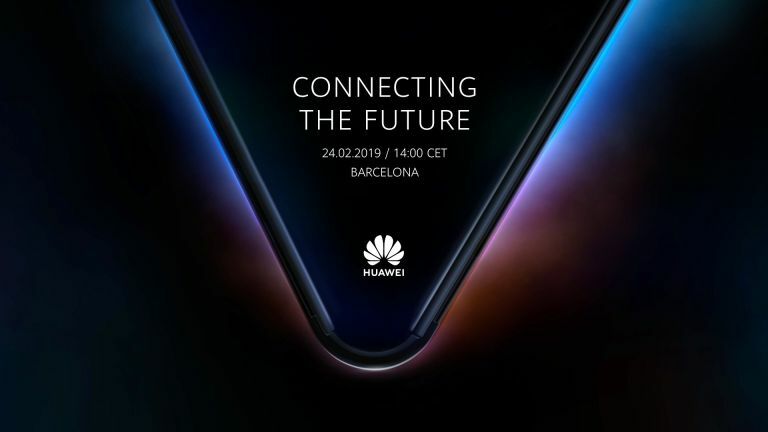 In what is likely a nod to the 5G capabilities of the Huawei handset, the promotional image mentions "connecting the future." After all, 5G is the connectivity standard of the future. So there we have it: confirmation that Huawei's Samsung Galaxy X challenger will be breaking cover in Barcelona at the end of the month. Huawei's MWC press conference is scheduled for Sunday 24 February at 2pm CET (1pm GMT), so mark that date in your diary, folding phone fans. As for when we'll see the launch of the folding Samsung Galaxy X? There's a Samsung Galaxy Unpacked event taking place on 20 February, which is where the new Samsung Galaxy S10 range of smartphones will be launched (though probably not the 5G variant). It had been rumoured that the Galaxy X would make an appearance at the same event. Well now, even if Samsung wasn't planning to show off its folding phone in its finished form at that event, you can be sure it's rushing to include it now that it's seen what Huawei is planning for just four days later.